I pulled up to Dad’s Kitchen, a small diner at 2968 Freeport Blvd. here in Sacramento and opened the wrought iron door only to find myself in the actual kitchen. “Wrong door,” the cook told me. I backed out and opened the door just to the left of Dad’s Kitchen’s kitchen. After following the sign in the back of an empty lobby, I found myself in a small, packed dining area. Dad’s has made the news recently as Guy Fieri has filmed a yet-to-be-aired segment of his Diners, Drive-ins, Dives show. The word has spread, and the person who seated me told me that it has busier since the news hit. It will most likely be even busier when the show airs next season. I have been to Dad’s on one other occasion, but do not remember the food—not a good sign. 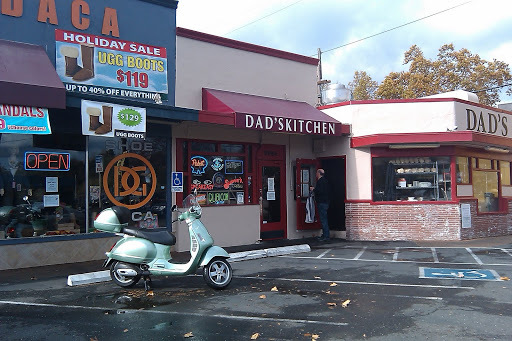 Some people have reported on the website Yelp.com that the food and service is not as good as the old Dad’s. I cannot speak for the old versus new Dad’s since I have never been to the old one. The service I received at this visit was fine though my burger took quite a long time to prepare. I was getting antsy when the server came up to apology telling me it takes a little longer to make a well-done burger. In my experience it does not take that much longer. 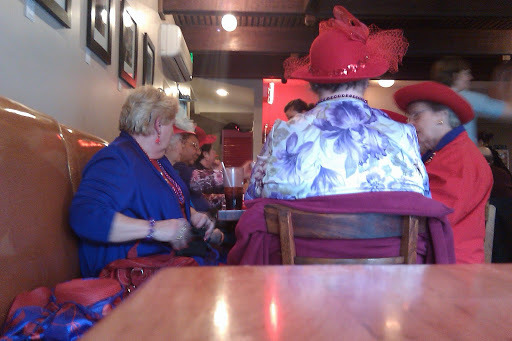 The fact that the little diner was very busy, including the Sacramento Chapter of the Red Hat Society, may have contributed to the long wait. I did not order my Dad’s Burger with the cheese selections that are optional (swiss, jack, provolone). I was unaware that the bleu cheese it sports is not applied after the burger is prepared or in the final stage, but earlier. The bleu cheese, as well as bacon, is ingeniously “crusted” over the burger giving it a remarkably robust punch. The patty is approximately 1/3 pounds of excellent Five Dot Ranch beef. Along for the ride are two slices of tomato, lettuce, and a slice of raw red onion. Aleppo chili spread is an inventive touch to this all-American dish. Finally, the burger is served on a terrific Artisan bun. 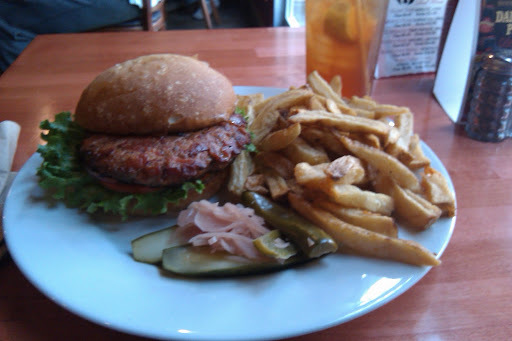 The burger also comes with sandwich dill pickles, sliced jalapeños and pickled onions on the side. I loaded all the side items on the already huge burger. It was one of the best burgers I have ever had. Dad’s serves their burger with a choice of chips, House salad, Dad’s potato salad, or plain fries to distinguish them from thei r three types of Specialty Fries (Garlic Parmesan, Seasoned, or Bleu Cheese-Habanero). Their plain fries are excellent. Cut and prepared with skin on, they are thick yet remarkably crispy and well salted. Dad’s Kitchen has a mess of intriguing items on their menu that warrant checking out. In addition, it is honorable that Dad’s Kitchen uses organic, hormone-free elements for much of its items, but I suppose I would award a radioactive burger the best in town if it tasted as delicious as a Dad’s Burger. I would check out the place before Fieri’s show airs and things get as crazy as it did when “Triple-D” featured the Squeeze Inn. The BBC children’s show Blue Peter walk us through how a Vespa is made. it is similar to my September 18, 2010 post, but cheeky, mate!